When 17 year-old student Jannik Sohn suddenly collapsed while at school due to a sudden cardiac arrest (SCA), he was rescued with the help of a HeartSine AED (automated external defibrillator). The defibrillator had just been installed the week prior to the incident by HeartSine Authorized Dealer, Biodata Medical. Through its Forward Hearts Program, HeartSine has donated a samaritan® PAD to the Deutsche Lebens-Rettungs-Gesellschaft e.V. (DLRG) on behalf of Jannik Sohn. 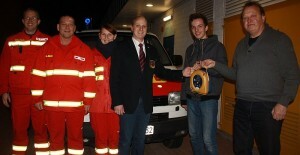 The DLRG is a non-profit relief organization for life saving in Germany that is based on volunteers. For our German speaking visitors, you can read the entire article by clicking here.